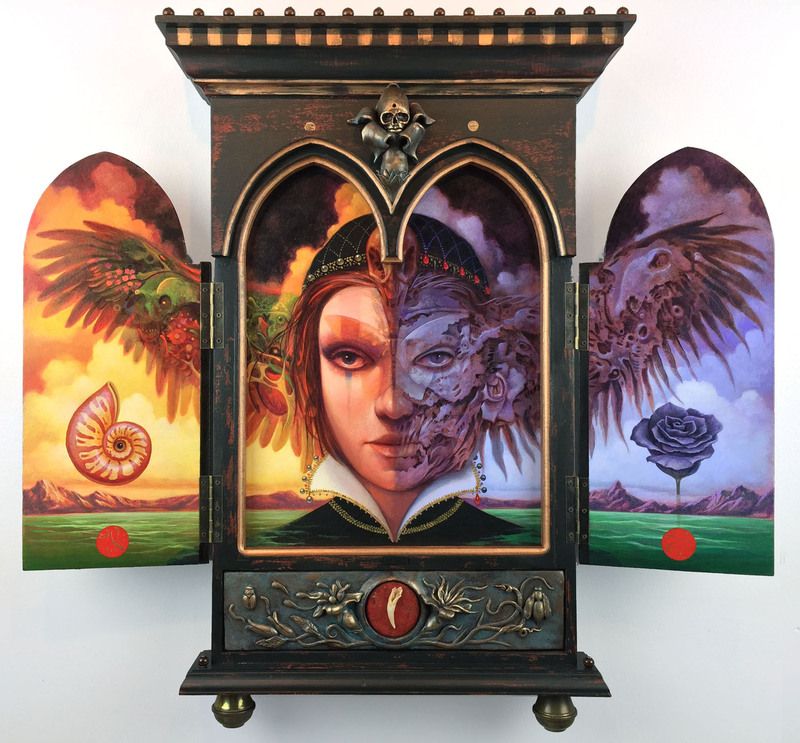 “Reliquary of the Twilight Emissary” 24.5 x 25.625 x 3.75” Acrylic on panels, wood enclosure, wood beads, brass and polymer clay. The new addition to the Dankquart Collection series. Both doors open in the above photo and both closed in the shot below. 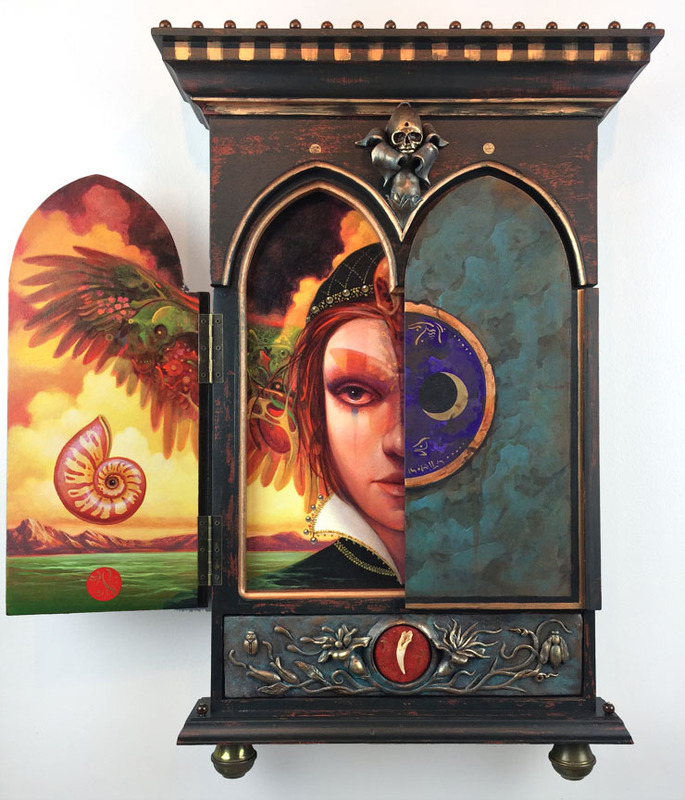 The sun and moon symbols on the exterior doors line up with the eyes on the emissary portrait inside. 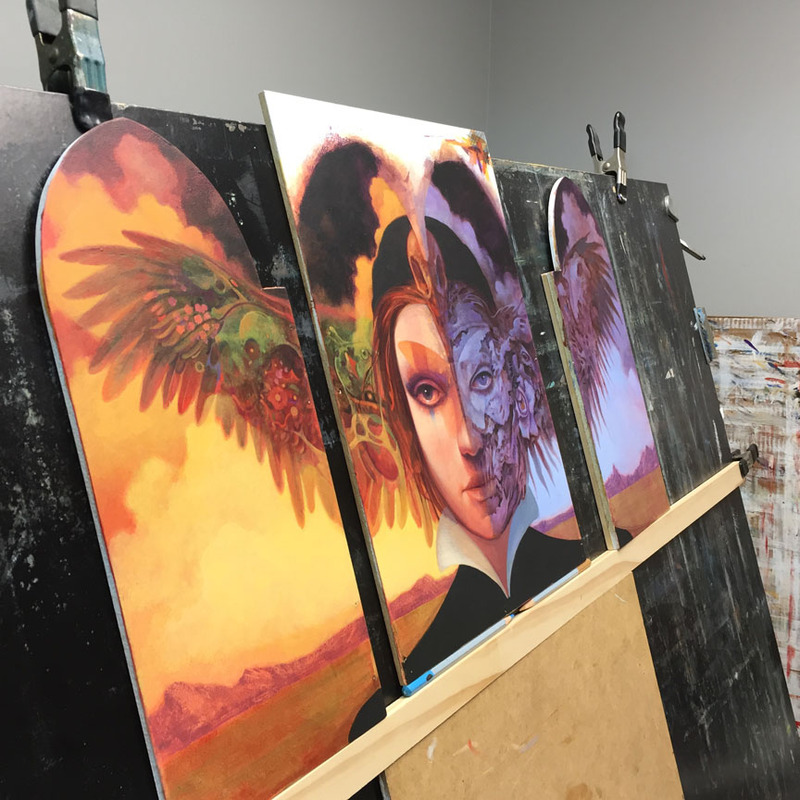 It’s a fairly time consuming exercise to create one of these pieces moving through the various steps from initial idea sketch to the completed artwork. Here are some in progress photos of a few of the stages. I began by developing a full size rough drawing based on an entry in my sketchbook. That was used to lay out the pieces used to create the wood enclosure which was built outward from the artwork and doors they frame. 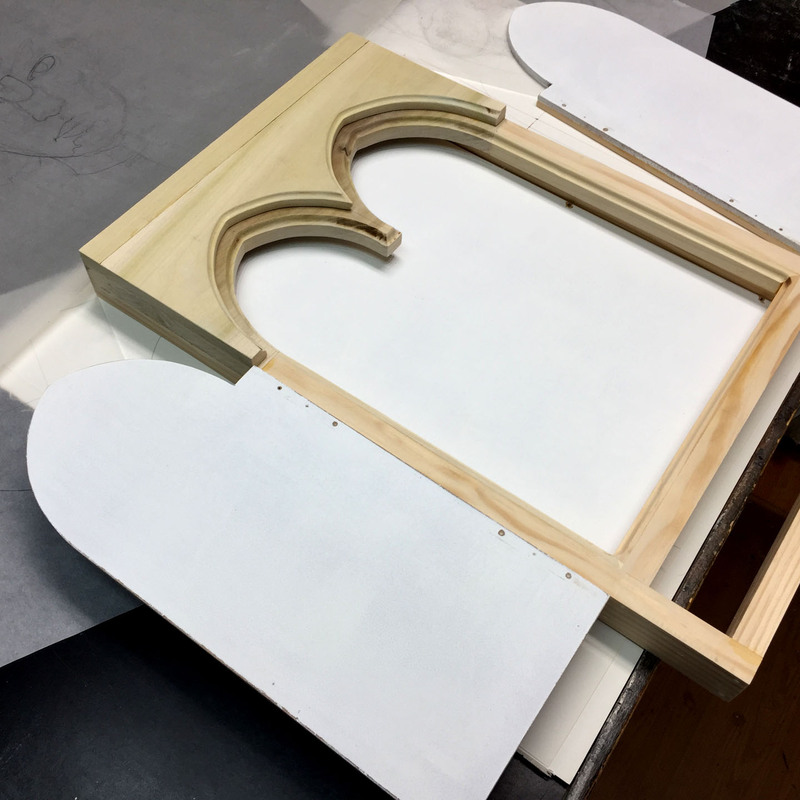 With the basic enclosure construction complete and the doors properly test fit on their hinges, I laid out the panels and put a basic drawing down on the gessoed surface. I rarely get very detailed with the drawing at this stage. Just enough to act as a solid guide. 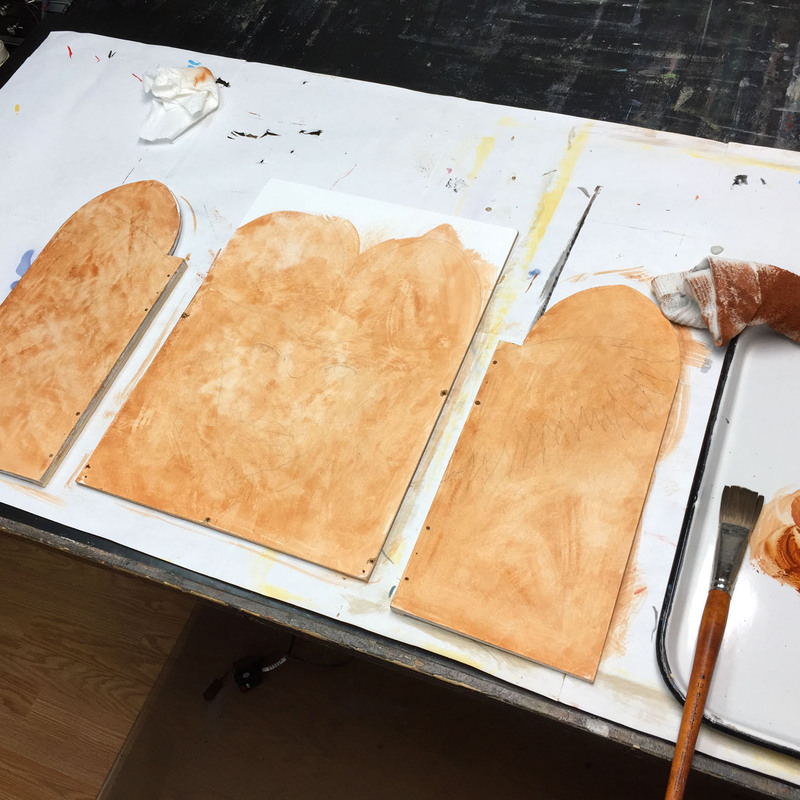 Then the drawing is sealed and the panels are given a glaze of burnt sienna acrylic. The lay in process continued with a basic monochromatic underpainting to establish value. Then I clamped a wood strip to my drafting table, tilted it to almost vertical, and used a few props to place the panels in position relative to way they would be when mounted to the enclosure. This allows me to work knowing how the subject flows from one panel to the next. I provide both for the distance from the central panel to the near edge of the doors and from the bottom of the doors to the bottom of the central panel. Turns out a couple of Derwent watercolor pencils were the perfect shim size to boost the central panel up to the right level. When the the painting was completed I moved to the bas relief panel that sits just below the doors. This is polymer clay built up on a piece of mdf. I used a round metal insert to act as a holder to hold the base of the tooth I would create later. 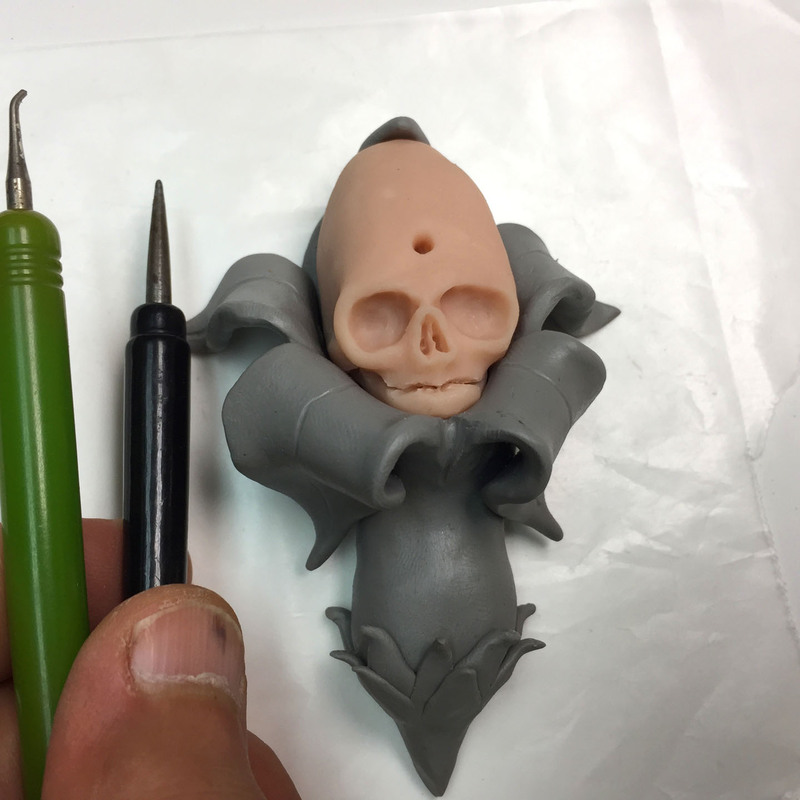 With the sculpting done it’s on to the paint stage. 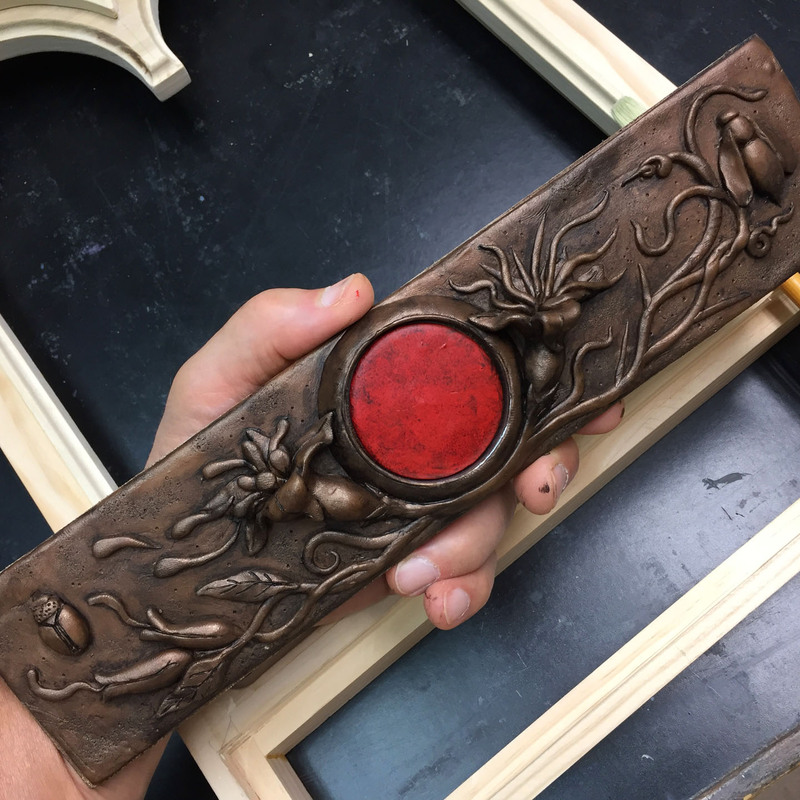 This requires several colors and multiple layers of acrylic paints and glazes to develop a rich antique bronze patina finish. There is also a skull in flower sculpt between the doors. Here it is in progress. 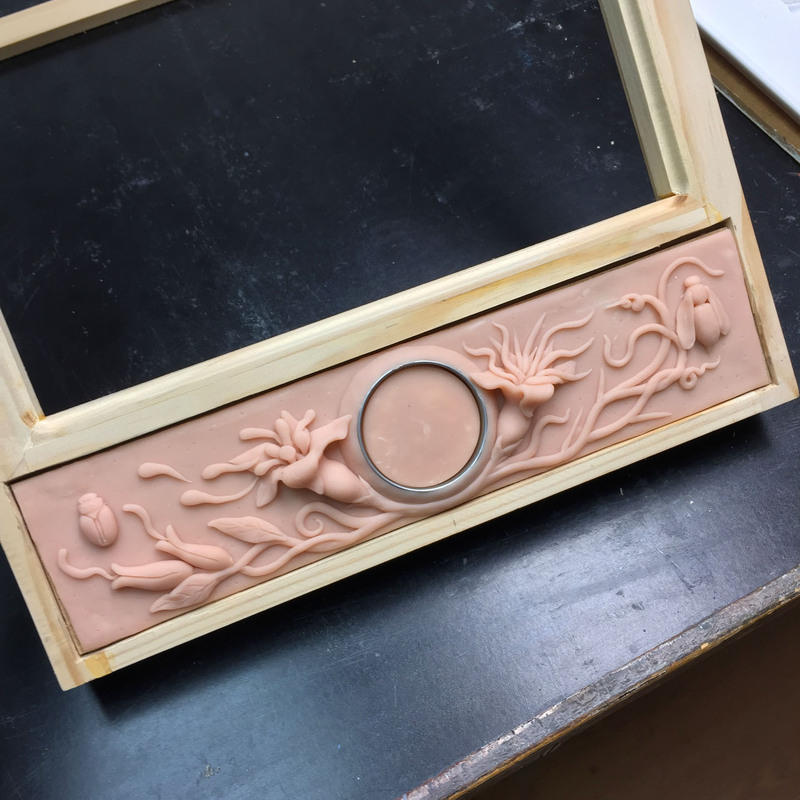 Part of the process is fitting the back of the piece to the molding on the enclosure so it will lay tight to the wood frame. As with the bas relief panel this little guy will be treated to a similar multi layer acrylic paint process, as will the wood enclosure. 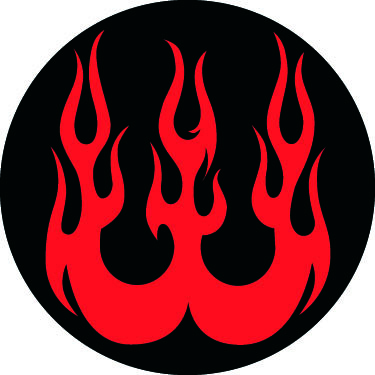 Only when all of the various elements are completed did the final assembly begin. That procedure took several hours in itself as a few minor adjustments were made. Holes were measured and drilled to mount the wooden bead trim and antique brass ornaments were attached at the bottom of the enclosure. 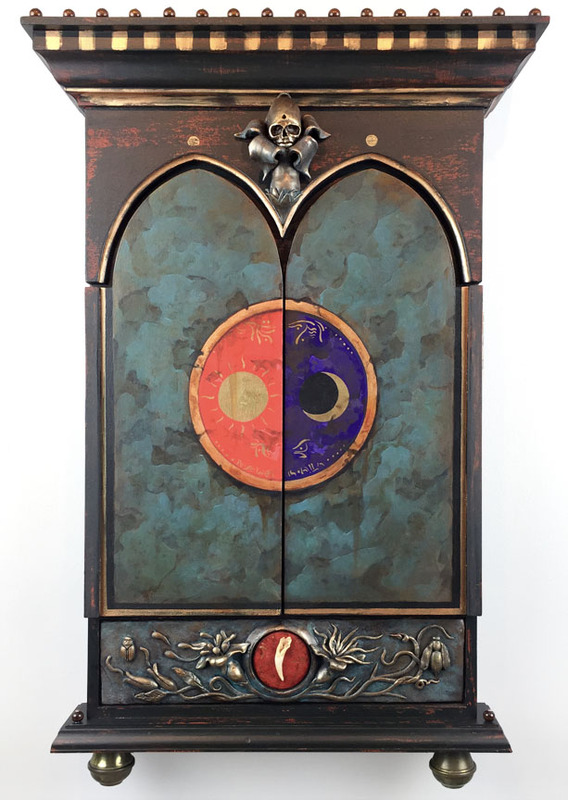 The central panel panting was placed, then the doors mounted. The very last step was to attach a hanging wire and felt pads to the back. Finished. If you would like information about purchasing this piece please email me using the Contact page here.